The history of the Dutch Flat Grammar School mirrors the history of Dutch Flat itself. Local legend has it that the log cabin Charles and Joseph Dornbach built in 1851 was on a flat piece of ground which is now part of the school grounds. This claim is probably based on individual recollections made years after the fact. Historical records from the time are sketchy, but there is little evidence to dispute the claim. The Dornbachs originally claimed an area three hundred yards by three hundred yards on the south side of Dutch Flat Creek. In 1859, Joseph Dornbach sold a parcel, called Lot 4, to the Trustees of Common Schools for the Third District of the Fourth Township of Placer County. This, and other lots acquired later, make up the school grounds as we know it. A single story, one room school was probably built around 1859. Early photographs show such a structure across the street from a still unfinished church. The Methodist Church was completed in 1861. This would not be the first school in town. A private school was in operation in 1856. (It is possible this first school was held in the house now owned by the Reioux family.) In 1875 a new schoolhouse was built. This was a large two story building with spacious, well lighted rooms. It had four classrooms and spring water was piped into the building. The building reflected not only the prosperity of Dutch Flat, but the town’s commitment to its children, their education and the future. The schoolhouse served the community until it was destroyed by arson fire on July 15, 1898. The $10,000 school was insured for only $3600. Dutch Flat’s population declined in the years after 1898. Hydraulic mining essentially ended in 1884 with the Sawyer Decision. The fruit industry rose and fell and except for PG&E and a few railroad jobs, economic opportunities became increasingly scarce. By 1962 enrollment was down to 18 students and only two students graduated from the school. In that same year the Dutch Flat and Alta School Districts consolidated and all students started to attend the school in Alta. Of course, this is not the end of the story. The Dutch Flat Community Club had been meeting at the schoolhouse since 1952. After the school consolidation, they paid rent to the newly formed district. The County Office of Education told the Alta School Board to sell the Dutch Flat School. Several individuals were interested in converting the building to private residences and there was even talk of tearing the old school down. State law at the time did not permit school property to be given away and the Community Club did not have the funds to purchase it outright. Senator Paul Lunardi, the State Senator for our district, was contacted and persuaded to introduce legislation permitting the transfer for $1. Tacked on to another bill, it passed, Governor Brown signed it and the Community Club acquired the building and property. In August 1964, the club was recognized by the Secretary of State as a California non-profit corporation. Today it seems like a natural progression for a community based organization to take over a community building. Article I, Section 2 of the Dutch Flat Community Club’s By-laws state: “Purpose: The corporation is organized to serve the philanthropic, civic, and social needs and recreational development in Dutch Flat, Placer County, California and nearby communities.” This they have done. Weddings and funerals, dances and barbeques, Sunday school, educational programs and political forums are but a few of the activities held at the old school. 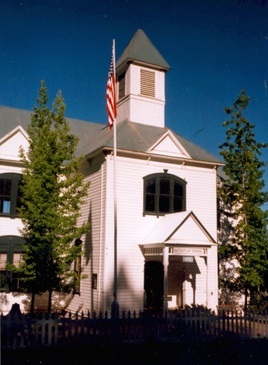 The building is now most often called the Community Club or the Community Center, but it is and always will be the Dutch Flat Grammar School. It is one of the most distinguished and historically significant buildings in the area and the center of much civic and social life. This history was written by Jim Ricker in 1998 as part of the 100 year celebration of the school building. Information was obtained from DFCC files as well as interviews with Janet Fonseca, Eleanor Bridges, Russell Towle, and Doug Ferrier. Visit the EVENTS page for further information on upcoming Community Center events. The DFCC has a Board of Directors which is comprised of volunteer members of the community elected annually in October by Center members. Membership dues are paid annually, $30 for individuals or $50 for a family (or whatever amount you are comfortable donating). Membership fees and contributions are tax-deductible, as provided by current tax laws. This picture was taken in approximately 1937. 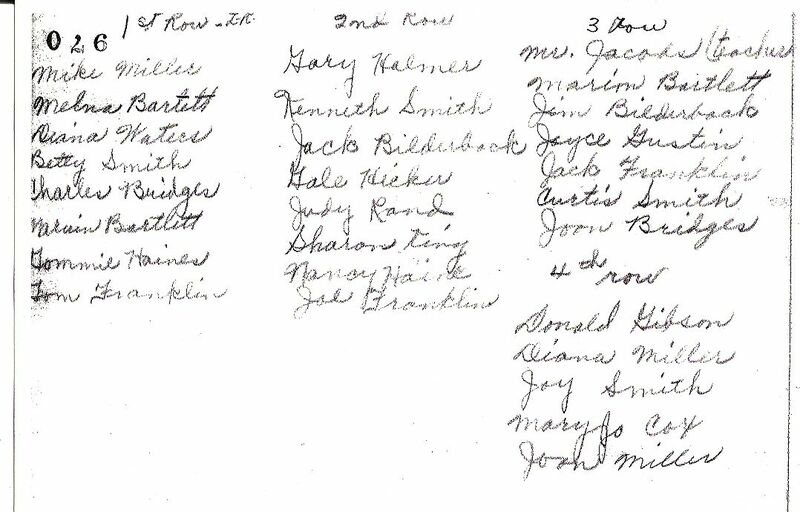 The names of the students and adults are shown on the right.